• RESIDENTS DIRECTORY, Updated 12-18-2018, now available in HOMEOWNERS INFO > RESIDENTS ONLY section of the Website (Requires Login). • The new TRADES DIRECTORY is now available on the Website. You must login (and a one-time registration is required!) to access the directory online. Once logged in, click on Homeowner Info on the left column, and scroll to RESIDENTS ONLY. If you are not logged in, you'll be prompted to do so. 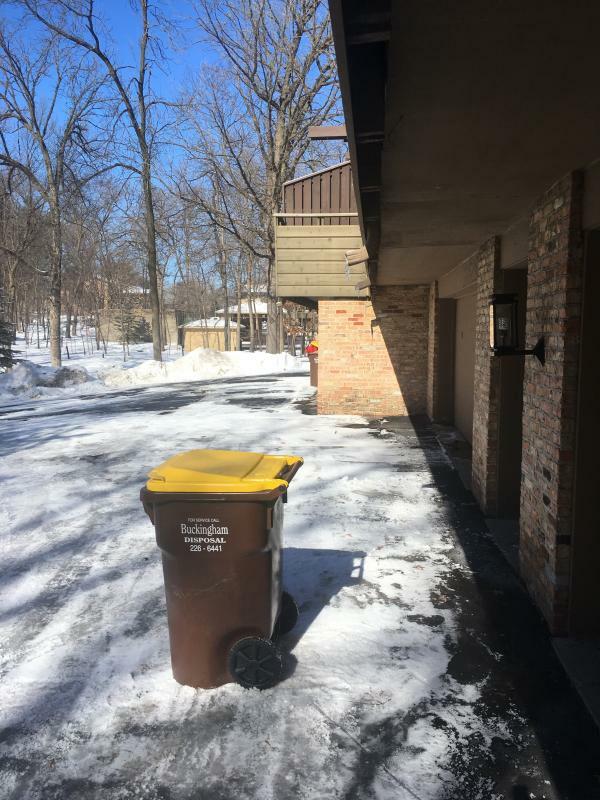 PLEASE NOTE: Improper placement of waste and recyclables bins by the garages prevents the speedy collection. The vendor provided guidance on what is proper and improper placement of the bins outside the garages. See below. 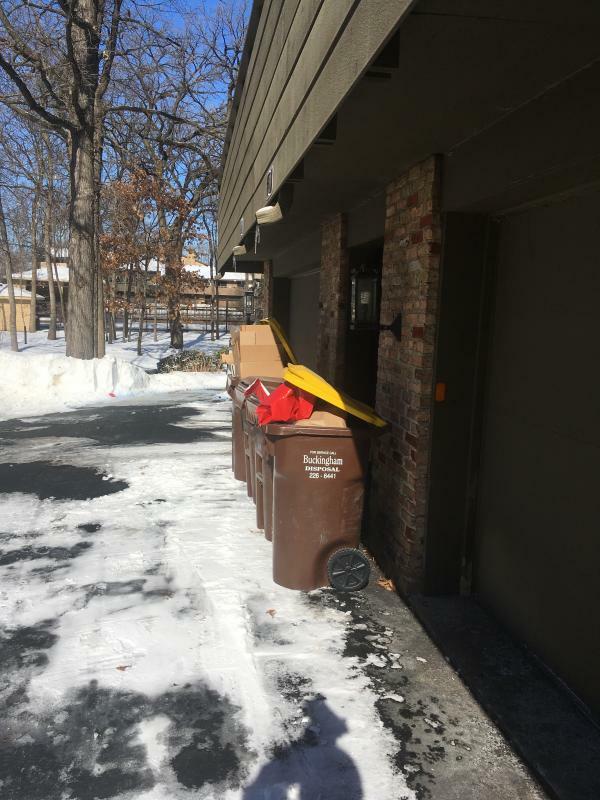 You may find that the snow plowing crews moved your bins to facilitate plowing. In that case PLEASE TAKE A MOMENT TO MOVE the bins back to the PROPER location so the waste collection may take place. The waste collection crews canNOT stop to move the bins for you. The cold weather and mountains of snow kept us inside. Hopefully, you used the time when the snowfall kept you inside, to clean out the closets and begin collecting and pricing your garage sale items. The Annual Birnamwood Garage Sale is just around the corner. Note: You may open and close as you please, but these are the published times. Registration Form: All necessary information and registration forms will be in next month's The Winds Newsletter and on the Birnamwood website. Please leave a note for Ave in the mailbox on the door of unit 193 (Association Mailbox) with your name, unit number, phone, email and the desired date. Need an account on the website? Click on REGISTER link, top right of this page, and follow the directions below. In the 1st block click NO on all questions. In the 2nd block enter your first name, last name, email (REQUIRED it is your "username" and the system communicates to this email address), unit number (we know your street..., home phone (with area code please, so we can find you fast in an emergency), work number and cell number are optional (don't forget area codes!) - IGNORE EVERYTHING ELSE in the 2nd block. In the 3rd block you can enter info for another resident in your home, or have them create their OWN registration. In the 4th block skip everything else. In the last block type into the box the fancy letters you see ("verification code"). Now you can click on LOGIN link and use the username and password you received.